Through Sweet Briar’s Outdoor Program, students demonstrate leadership, build confidence, and are awed by the wonders of the natural world. 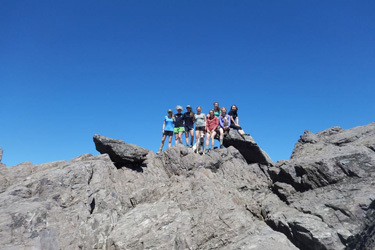 Trips and adventures take students, faculty and staff near and far for day trips, weekend adventures and extended trips over the fall and spring breaks. Join us to go backpacking, kayaking, rock climbing, caving, rafting, canoeing, skiing, hiking. Most trips are beginner-friendly, and all equipment is provided. Costs are discounted for students. Check out the trip schedule, find something that interests you, and stop by the office to sign up! We hold regular kayaking clinics in Sweet Briar”s pool for all experience levels. We will get your ready to head into the woods with backcountry living skills such as starting a fire and setting up a tent. We also offer equipment for rent, and resources to help you plan your trip, including books and maps.